She uses this phrase when describing a particularly difficult time that her family is going through – the sleepless nights of having a newborn, the stress of living three hours away from her husband while waiting for their house to sell, homeschooling her rambunctious second grader with a toddler underfoot. 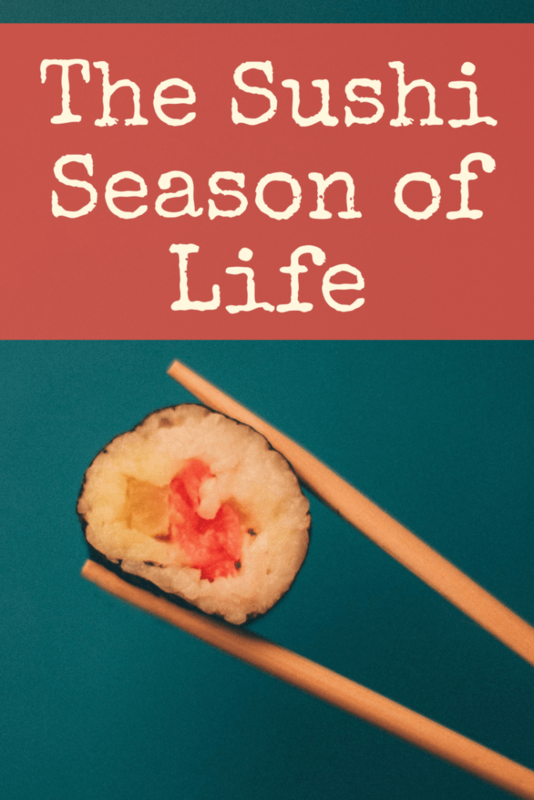 This post, The Sushi Season of Life: Finding Joy in Hard Seasons, contains affiliate links for your convenience. This means that if you click on a link and make a purchase, we’ll receive a small compensation at no additional cost to you. Read our full disclosure policy. But through all of her words, you can hear her joy. She describes difficult “seasons of life” like a true Proverbs 31 wife. When I think about seasons, I become a crotchety old lady. I complain about my current season and cannot wait to get to the next season, only to find once I’m there that it has problems too. It’s the same with the seasons of life. But here’s the thing – I have an eight year old who chatters non-stop from the moment she wakes until the moment she falls asleep. I’ve literally watched her on the monitor as she lies in bed alone, and she is still talking. And there are times (at least once a day) that I wish desperately for a moment of silence from her. I wish that she was nine months old again and I could just hold her and be with her without the incessant questions and chatter. But I also know that there will soon be a day that she is a teenager who won’t want to talk to me. I will remember her sitting on the stool in my kitchen talking about boys and teachers and dreams and owls and books and mean girls and feelings and the “steps of her day” and homework. I will hear a song and remember how she got the words wrong, but sang them with the unabashed confidence only eight year-olds can manage. And then I will wish desperately for her to be eight again and to tell me every detail of her day from start to finish. You see, when I view my life in seasons, I tend to do exactly the same thing that I do with the annual seasons. I forget to enjoy the crisp bite in the air of Autumn and instead wish to hurry on to the cold enough for a coat weather of winter or missing the warm blanket of summer. To combat this, I’ve started to simply thank God for the weather whenever I find myself noticing it. I stop the wishing thoughts and instead say a quick prayer of gratitude for bright sunshine, heavy rain, falling leaves. In doing this, I’ve been able to curb my natural proclivity towards always wanting to rush to the next season or lamenting the season passed. I am learning to enjoy whatever the wind brings my way. In much the same vain, I’m learning to enjoy the season of life that I’m in – even choosing joy in hard seasons of life. I’m doing this through all of the traditional ways – focusing on the present, writing daily gratitudes, remembering how fleeting these young years are, etc. But I’m also enjoying my current season of life by creating joy in this season. I don’t think that joy is just lying around waiting for us to find it. To believe that, means that if you don’t have joy, you simply didn’t look hard enough. Sure, there are those moments when your baby snuggles onto your shoulder and sighs “mama,” in the sweetest, most content voice. Or your two year old poops on the potty instead of in the floor. Or your six year old gets a sticker in his folder instead of a note about his misbehavior. Or your eight year old tells you a story about an amazingly mature, Christ-like decision she made at school, and it makes your heart soar with joy. But there have been many days that I know there was no joy to be found. I’m sure the devil was in my home snatching up every single piece of it before I’d ever had a chance to see it. So instead of searching the nooks and crannies or waiting for the moments, my husband and I have committed to creating joy. This looks different in every home and in every season. We have four children ages 8, 6, 2, and 1. They are simultaneously a fantastic blessing from God that I wouldn’t trade for anything and the cause for the deep in my bones exhaustion I feel. It seems like everything we do takes an hour – bedtime, leaving the house, showers, getting dressed, homework, chores, eating dinner, etc. So most nights when we finally have the kids in bed, my husband and I are beat. We drag ourselves into the kitchen and clean it because that’s what all the blogs about being productive say you should do. And then we go to our bedroom and crash until sometime in the middle of the night when someone has a fever, needs a bottle, had a bad dream, or a rocket from Space X rattles all of the created order. But every once in a while, my husband or I will pick up a pack or two of HEB sushi. The presence of that glorious clamshell food case in the fridge is our sign. Without saying a word, we know that we are going to do a strong push to have the kids in bed by 6:30. At that point, we will meet in our bedroom and eat sushi in bed while talking and watching Elementary or This is Us if my husband is feeling generous and emotionally vulnerable (Why does Jack have to die?!?!). It costs us $20 and putting up with a little extra bedtime grumbling, but it creates joy for us. It gives us a chance in the middle of this season to remember with fondness the season before kids. It gives us a preview of a coming season when we will have lots of quiet, restful evenings at home. 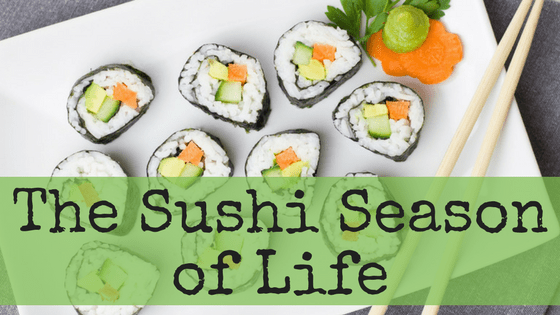 So, here’s to the Sushi Season and all the seasons yet to come. What ways have you created joy in your current season? Awesome post! Thanks for being transparent. Love it! I too am on a quest for joy this year (it’s my one word for ’17) and it’s my blog theme for this month. Love how God orchestrated me finding you while #findingjoy this month. Hang in there, seasons change but like you said, it’s about being purposeful in the midst of it to find the joy Jesus died to give us! (Can you guess what my blog post is on tomorrow?) Enjoy your joyful sushi season! Jill, that is so awesome! I love that you’re spending a month focusing on joy. I definitely need to do that too! YES! A thousand times this! We are in a very similar season, and I love the way you spoke of creating joy! Sometimes, it’s necessary just to laugh. I remember as a little girl, sometimes my mom would just start laughing — and before we knew it, we had all joined in! It didn’t matter what had happened earlier in the day, we laughed together. Love it! Our date nights are frequently take out sushi and a show as well. I’m looking forward to the age when we can leave them all at home but these at home dates are significantly cheaper so I’m enjoying it now! I love eating in my bed and watching tv in my bed so much!! I think it’s because I wasn’t allowed to as a kid. 🤷🏻‍♀️ I totally agree about wanting to leave them at home but also loving the money savings! !